This certainly looks like an interesting story! I'm excited to see that you've given Erik a life beyond his obssession with Christine ((and the cheeziness of Coney Island)) and instead used a setting I'm guessing is foreign to quite a lot of us and, therefore, has more of the mystery (or romance) that the original had. Sadly I won't be able to get my hand on the book for at least some time but I wanted to let you know I have a good first impression. Thanks for the well wishes. I am having a few contests around to win copies of the book and I'll keep you advised. There will be one on Goodreads, Author Island, and CoffeeTime Romance. Sometimes I have extras too. But yes, the setting was fascinating. Valletta was rich in history, had a wonderful opera house that just fit perfectly. I'm excited that the isle of Malta is embracing my release. Their newspaper contacted me, asked for a copy of my book, read it, loved it, and wrote a great book review as well as an interview. I find the Maltese to be very supportive and kind, actually. The Royal Opera House setting is a passionate location and bringing the Phantom to their small isle seemed to be quite the blessing. Here is a link to the review, if you're interested. It's entitled, "Goodbye Paris, Hello Valletta." 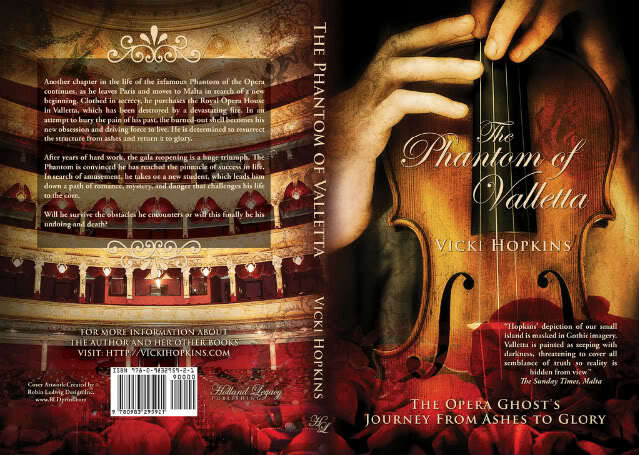 The Phantom of Valletta has been re-released at a new lower price through Holland Legacy Publishing for $12.99 in print and $2.99 in eBook. I'm very pleased with the new interior, which fixed a few items thanks to my Maltese friends who love the book and gave me some historical advice. The Sunday Times, Malta, was gracious enough to agree endorsing the book with a quote on the newly revised front and back cover too. Though the book hasn't seen much interest in the Phantom community yet, I'm very happy for how many on the isle of Malta have embraced the story with great enthusiasm. The fact that I took the infamous Phantom of the Opera and brought him to a highly beloved opera house that once stood on their island, has stirred Phantom fans in that area of the world. It only shows to me how our beloved Opera Ghost continues to incite interest worldwide in the hearts of many. In any event, here is a link to Amazon and a picture of the new cover and trailer. Thanks all. "He purchases the Royal Opera House, which lays in ruins..."
Thanks, I'll pass it onto my "editor" that I paid $400 to check it before going to print. Next time I'll hire you! I am happy to report that Miller Distributors, the largest book seller on the isle of Malta wants to put The Phantom of Valletta in their bookstores. The residents of the isle continue to embrace the story because of the setting at The Royal Opera House.